A few weeks ago I was lucky enough to witness (and photograph) one of the most spectacular natural phenomena I could ever have imagined. I was birding on the Edwards Plateau (Hill Country) about an hour east of San Antonio in southern Texas. One evening, my birding companions suggested we visit a nearby bat cave to watch the Mexican Free-tailed Bats fly out at dusk. Not knowing what to expect, I packed all of my camera gear with a healthy dose of curiosity and anticipation. After a long drive through a private ranch, we arrived at the cave, located on the side of a hill in the semi-arid, rocky habitat. A member of Bat Conservation International, and a local naturalist were both on hand to discuss the significance of the site and biology of the Mexican Free-tailed Bats. 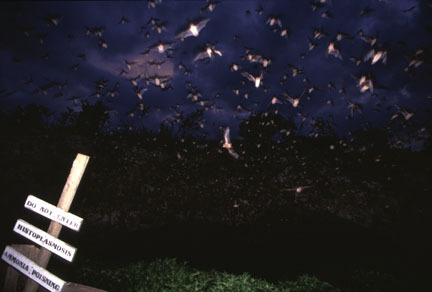 An estimated 10 million bats were using the cave, and each night at dusk, they would emerge to feed. And emerge they did! The first few bats came out as a trickle. But moments later, the trickle became a torrential river of bats, emerging from the cave at a rate of thousands per minute and stretching out over the countryside for miles. The sheer magnitude of bats left the crowd in awe, and me nearly speechless. I quickly tried to collect my thoughts to determine the best way to capture this phenomena with my camera. 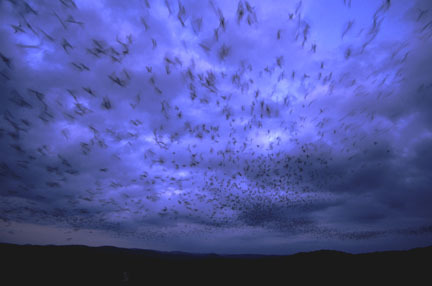 Though the stream of bats would continue for about 3 hours until they had all left the cave (talk about rush-hour traffic), the day light was fading fast. The only film I had with me was Fuji Velvia, a slow, but fine-grained choice. I pushed it one stop (as I always do) to get an extra bit of speed from it. Compounding my film dilemma was the uniqueness of the situation - I knew I would have to experiment and hope for the best. At the very least, this would be a photographic learning experience for me. For my first series photographs, I wanted to capture the magnitude of the river of bats as they undulated over the landscape. I armed myself with an ultra-wide angle lens(20mm) to achieve this, mounted the setup firmly on my tripod and fired away. I consciously included the hillside in the scene to balance the image. A roll and a half of film later, I was satisfied that I had captured my desired image in the first series. 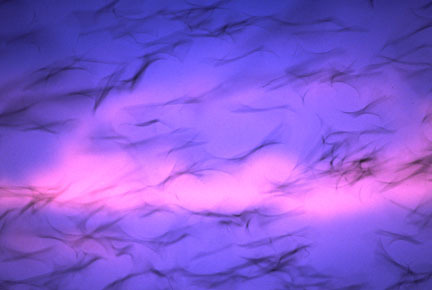 I mounted my super telephoto lens (600mm/f4) onto the camera, locked up the tripod and began firing into the most dense clusters of flying bats. I knew the resulting photos would not be in sharp focus, but hoped to capture some artistically blurred images. By repositioning my camera setup, I was able to choose the brightest (and most colourful) part of the sky to create an interesting background. In near darkness, I switched back to my wide-angle lens and added a flash to make my final series of photos. By standing near the opening of the cave, I was able to get very close to the emerging bats. The flash enabled me to stop the action as the bats flew towards me. The resulting photos are my favourite of the trip. Overall, the experimentation paid off and added to the rich experience of that night. And I’m already planning to go back to do it again!